Tomorrow the local television channel, Channel 9, features two documentaries that might interest local readers. One covers the use of 1080 to control pests, the other the covered stadium under construction. Let me first start with a short documentary that I encountered while researching for this post, which show great footage of New Zealand bats and discusses the impact of 1080 control on assisting conservation efforts to help them. I’ll confess it is the footage of the bats that appeals! They look great little beasts. 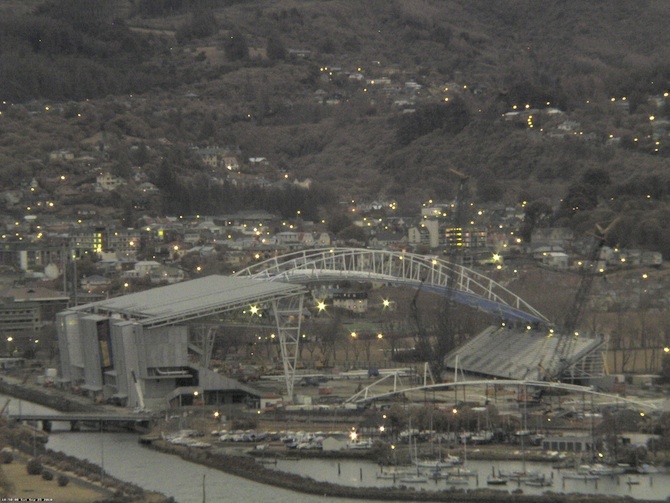 As everyone in New Zealand will know, a major development in Dunedin is a covered stadium. The issue has split rate-payers who are covering the bulk of the cost of construction. University of Otago will be using facilities at the complex. I’ve been watching it rise, the size and the span of those beams are impressive. At 7:30pm on Sunday 26th, the first of a series of documentaries will screen ’exploring the history of Dunedin’s Stadium and a look into the features on offer.’ If you haven’t seen the stadium, you can view it from a local webcam and Our Stadium. Progress updates and reports can be found at What if…? Dunedin (formerly Dunedin Stadium). There’s also a Facebook page of course. Following this, at 8pm, is a documentary from graduates of the Otago University Centre for Science Communication that looks at the use of 1080 (sodium monofluoroacetate) for pest control. (For any overseas readers that have gotten this far into my post this is used to tackle pests in our wilderness areas, possums, mice and rats in particular.) A trailer to the documentary can be viewed below, also available via the film makers’ blog with comments. In the last clip, the dog taking the rat poisoned with 1080, and then portrayed as getting poisoned itself, is apparently wandering unsupervised off-leash. Last time I checked, this was illegal. Dog owners are supposed to keep their dogs under their control at all times. There are lots of things that straying dogs get up to, including savaging children, savaging sheep, spreading hydatids and sheep measles, defecating on property that does not belong to their owners, getting hit by cars, and taking other poisonous baits such as anticoagulants and cholecalciferol. I have no sympathy for dog owners who complain when their dog eats 1080 while straying. If you really love your dog, you keep it under your control at all times, for its own sake as well as out of consideration for others. I’m not saying that dog owners should never let their dogs offleash while walking with them, but light, comfortable wire muzzles, that don’t hold the jaw shut but which prevent eating, can be purchased to ensure that the off-leash dog can’t eat dead vermin. People who let their dogs wander and then snivel when they come home mortally poisoned are hypocrites.